The show opened with everyone on stage singing a rousing number of "I'm Forever Blowing Bubbles" and "S' Wonderful", which I must was say it was S' Wunnerful, S' Wunnerful! S' Wunnerful! All the kids, Clay Hart, Sally Flynn, Tanya Falan, Cissy King, Michael Redman, Joe Feeney, Gail Farrell, Ken Delo and Sheila & Sherry Aldridge, were on top of their game and stayed that way for the show. Ken Delo was our emcee, and did a great job with his singing and comedy, which will come later on. 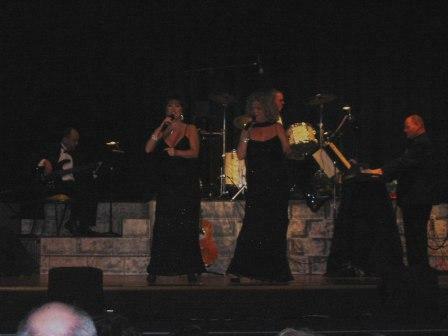 The first act was the Aldridge Sisters, Sheila & Sherry, who sang "It Takes Two" and "Blue Bayou" and looked and sounded gorgeous in both aspects. They were followed by Sally & Clay with "United We Stand" and "If I Were A Carpenter." They sure did, and still sounded like a talented couple deeply in love, and the audience knew it! Another one of my all time favorites, Tanya Falan, was next and boy she can still knock 'em dead. Our Italian sweetheart sang "It Had To Be You" and "I'll Be Seeing You," and that brought a thunderous appaluse from the audience. She also filled in on what been going on in her life, how her children and grandchildren were doing, and she still is a very young lady! 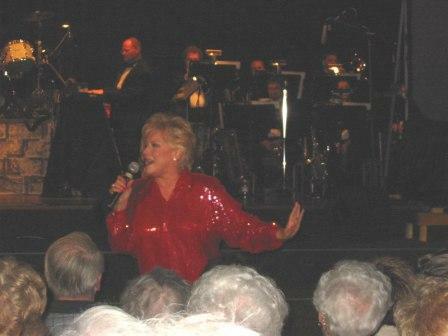 Next, Ken came back out with "That's Life" and "Music Of The Night" followed by another favorite Cissy King, who sent many hearts a flutter in her red satin outfit singing "Rhumba Girl" and "The Mexican Hat Dance" which the audience got a kick out of. She also told us about her latest project, a two woman play called "Always Patsy" which is about country legend Patsy Cline and her pen pal. It is now in touring production status, soon to come to a town or theater near you! Sheila & Sherry Aldridge sings "It Takes Two"
Next out was Gail Farrell, whose piano playing of "Root Beer Rag" and "Piano Picker", brought down the house! She also filled us in on her life as she and husband Ron Anderson were getting settled in to their new home in Northern California, and their twin daughter's upcoming college graduation...what is more is that one of them is getting married just a week later....talk about being a happy and busy parent! Later, she was joined by Michael Redman for a rousing number of "Sunny Side Of The Street", and then Mike went solo by crooing to the ladies in the audience with "Chances Are." Ken Delo came back out with his comedy routine plus a very funny rendition of "What's The Matter With Kids Today?!" and that left the audience in howls of laughter! Like I said, Ken is the consumate performer, and a great guy to boot. Sally sings to the folks! Cissy King sings that "Mexican Hat Dance"
Clay & Sally came back out with their country routine, and those two were a ham....singing the "Stand By Your Man/Woman" medley in which Sal came out to the audience singing to the folks....and that was good. 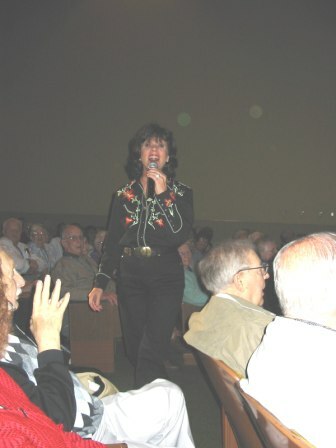 In fact, two of my best pictures had Sally singing in the crowd! 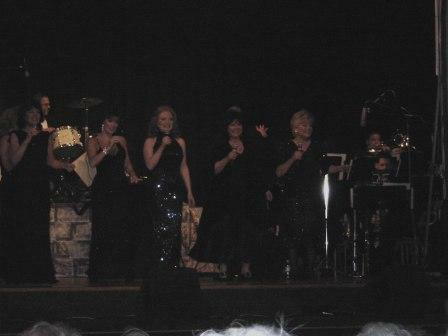 They also did the ol' "Orange Blossom Special" in which Sally showed off her chops with her fiddle, just like Bob Lido did back during the show's run. Next out was Joe Feeney, our Irish tenor, singing an Irish meledy of goodies, most notably "Danny Boy". He was decked out in a green tuxedo, and his vocal presence left a mark on the folks, I cannot noticed that during "Danny Boy," there were many in the crowd that had a tear in their eye....he is THAT GOOD. Finally, we got to meet Bob Duncan, formerly of the Blenders from the show, and introduced us to the band and thanked all of us for coming, plus also gave us a brief bio on his life and family. While not producing, he mentions to the crowd that he sings with fellow Blender Steve Smith in the vocal doo-wop group, The Diamonds. Then the whole cast came back out stage for the closing numbers, a musical salute to all the fifty states of the USA followed by the "Adios" closing song. All in all, a very very wunnerful show. Then came the best part, the meet and greet! I got an excellent chance to meet the kids, got to take plenty of memorable pictures on my camera, say hi and just darn plain be friendly! Everyone in the show is so special and talented in their own different way, and we have the legacy of Lawrence Welk to thank. By the way, if you want those guys to come to your town, tell your local promotion company to bring 'em in!